“Look, Myra-Jean, it’s a praying mantis!” I called, all enthusiasm and good-will. Myra-Jean came over and regarded it. “It’s very large,” she said soberly. Mike did. No fond farewells. The locust took his trade elsewhere. Gross, gross, gross. 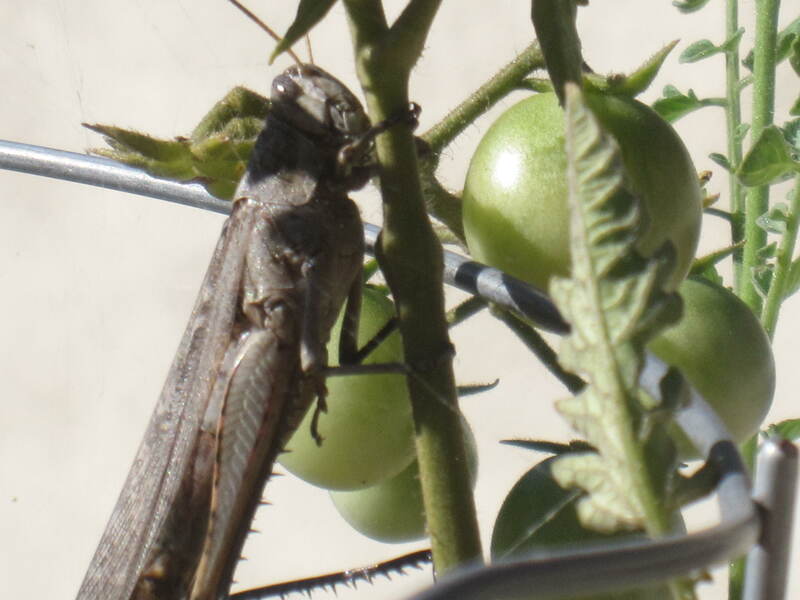 This entry was posted in Garden and tagged cherry tomato pests, grasshoppers, locusts on August 30, 2012 by thumbstumbler. Um I think that’s a tierra de los ninos. I found one in our basement at school and the asst principal made fun of me for getting someone else to take care of it. UNTIL he saw it…. he thought I was exaggerating. At first I thought it was a plastic model from a science kit, but then I realized it was REAL and likely played as an extra in Stephen King movies. Shudder. Or maybe it’s ninos de la tierra. Sorry I have no Spanish. Wait I could be wrong. Those other things are even scarier looking.